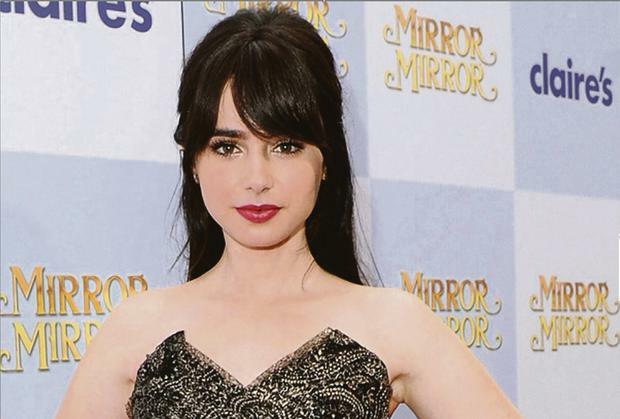 Lily Collins's grandmother Jen Hale was a famous ballerina during the 1940s. So it's all the more apt that the beautiful young actress has been chosen to become the face of Lancome's Spring 2014 make-up collection, French Ballerine. Dressed in a ballet-length gown and pumps and of course wearing the company's cosmetics, the 24-year-old daughter of Genesis singer Phil Collins was transformed into Lancome's urban ballerina through the lens of photographer Mario Testino. It's the latest in a list of career successes for Lily who is fast becoming a performer to watch out for. An actress, model, and television personality, she's probably best known for her role as Clary Fray in the fantasy film adaptation The Mortal Instruments: City of Bones, based on Cassandra Clare's best-selling novel City of Bones. Collins is the half-sister of actress Joely Collins and musician Simon Collins, from her father Phil's first marriage. Her particular brand of luminescent beauty really suits the French Ballerine range which features a Doll Eyes Palette of eye shadows -- in all manner of dusky to earthy pinks, of course -- and a Highlighter Blush compact, both of which come in mirrored cases adorned with a hot pink bow on the top. There's no harm in remaining on good terms with your body, especially given our recent bout of self-indulgence. Like so many things, good health is as much about prevention as cure. Chef Brian McDermott had the role of a senior global product developer in the food industry when he was diagnosed with a chronic heart condition. He's one of only a handful of Irish chefs with a culinary arts degree, and had a successful career behind him working in the kitchens of some of his native Donegal's most lauded establishments. Following the shocking revelation about his heart health, Brian decided to change his lifestyle, and consequently his cooking style, and established a reputation for himself as "the no-salt chef" -- cooking great tasting, accessible and affordable food without adding salt. Now his No Salt Cookery School in Moville, Inishowen in Co Donegal is proving popular with lovers of "clean and honest" food. Courses include Seafood Masterclass, Mastering Sunday Lunch, Curry Club, and Men in the Kitchen, with prices starting at €35. IRISH company Finline Furniture has been putting a seat beneath our bums for more than 30 years now, as a leading supplier of sofas and chairs to the likes of Brown Thomas and Arnotts. Anyone in need of a new sofa will be delighted with the news that the company's biggest factory sale -- with reductions of between 40 and 70 per cent -- will take place over three days next weekend. The company's furniture- makers have been with Finline for an average of 16 years each, and their experience shows in the contemporary and luxurious sofas they create. Both sofas and chairs in the sale will come with a 10-year frame and construction guarantee, and there will be a choice of over 500 fabrics to choose from. Expect good savings in the sale, including the La Scala design in Kadiffe, down from €1819 to €1050, and the Alex design in Semiramus reduced from €1862 to €1050. The sale takes place at the Finline Furniture Factory in Emo, Co Laois, next weekend, running from Friday 10th to Sunday 12th. Deryn Mackay of Khan Boutique is over the moon at the arrival of Pauric Sweeney bags in her Blackrock shop. "Pauric's bags are like a piece of sculpture," Deryn added. "There is a sense of timelessness about them which all great design has." She bought her own much-adored Pauric Sweeney bag ten years ago. "When I go to shows, it gets clawed by people asking me where I got it and who designed it," Deryn said of her pride and joy. "It's also important that we all support Irish designers during a recession." Khan is stocking the Pauric Sweeney Anniversary Overnight Collection, a range which celebrates the ten-year anniversary of the best-selling Pauric Sweeney style, the Overnight in Python. Bag prices are in the region of €2,000. If you're looking to entertain the children without breaking the bank, why not pop along to the Asgard exhibition at The National Museum of Ireland, Collins Barracks? The yacht is one of the most iconic items of recent Irish history, beginning with her building in 1905 by Colin Archer, a Norwegian naval architect, for the author and nationalist Erskine Childers, father of President Erskine Childers. The Asgard's most pivotal role was in the 1914 Howth gun-running saga, when guns were smuggled on shore for the Irish Volunteers. She was later used as Ireland's first national sail-training vessel. The Asgard's story is intertwined with many of the wider episodes of 20th century Irish history which are on show at the museum, including the 'The Easter Rising: Understanding 1916' and 'Soldiers and Chiefs: Irish Soldiers at Home and Abroad Since 1500'. Most importantly, given it's the month of January, admission is free. Fancy a designer dress without paying designer prices? Covet, The Borrower's Boudoir, a designer rental boutique in the Powerscourt Centre, is about to sell off some of its contents to money-savvy style fans. If you want to get your hands on a Temperley, Rachel Gilbert, Valentino or Badgley Mischka dress -- then note the following dates in your diary. The sale of the former rental clothes, which will include some drop-dead gorgeous coats, will take place on Saturday 11th (10am to 6pm) and Sunday 12th (12pm to 5pm) at the designer rental boutique on the top floor of the Powerscourt Centre, off South William Street. Expect some magnificent vintage finds, and in some cases there will be up to 95pc off retail prices.